An attractive, usable website is fundamental to any online business. 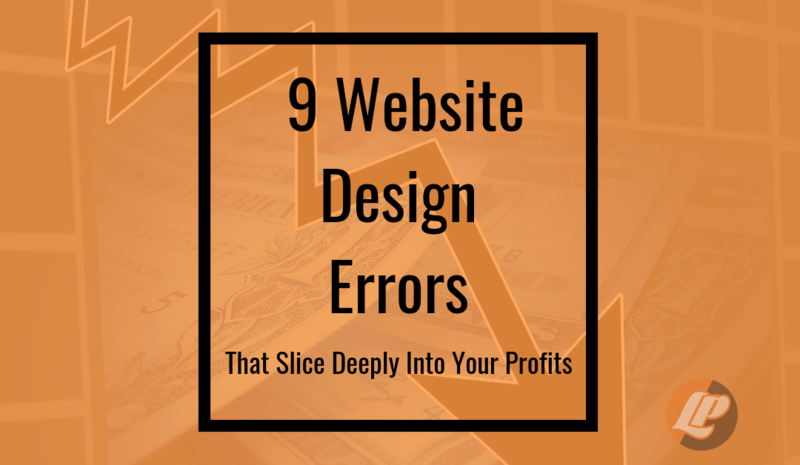 Unfortunately, some common design errors can weaken a site’s performance and slice deeply into your profits. The good news is, most of these issues are relatively easy and inexpensive to deal with. Whether you’re building your own website or using a design agency, make sure you steer clear of these issues right from the beginning. Clear site navigation is essential for acceptable conversion rates. Your visitors could arrive via any page, and they need to find their way to the money pages without confusion. Before thinking about looks or fancy features, draw up a logical structure for your content. Aim to keep the most important pages no more than two or three clicks away from any part of the site. However, don’t overload the visitor with too many links to choose from on each page. The simpler and more direct, the better. Crucially, try and anticipate future developments, and leave room for your site to grow. Trying to tack new navigation onto an existing site is much harder than designing an expandable structure from the outset. Don’t overload your pages with dense blocks of text, excessive images or animations, or too many choices to make. Keep each page simple, clear, and scannable. Presenting the user with too much to process means they’ll quickly back out. Also, the content should focus on its main topic without wandering down sidetracks. Don’t try and cover too much ground on a single page; if necessary split a large subject up into smaller, more digestible chunks. Although current search engine algorithms seem to favor longer written content, users tend to bail if the page seems like an effort to read. Aim to find a good balance between depth and accessibility. Depending on your development platform, using accordions, popups, tabs, etc can help minimize the overload factor without killing SEO value. In the same way, don’t overcomplicate the visual design of your pages. While good looks are a bonus, easy understanding of content is much more important. Before adding extra gizmos or non-essential eye candy, ask whether it improves the customer experience or just feeds the designer’s ego. Your design should be very intentional. Some of the best designs not only tell a story but speak directly to the problems of the user – rather than the features and benefits of the site owner. Too many websites feature contact or about pages almost as an afterthought. In reality, they’re among the most important parts of the conversion process. A large proportion of visitors check these pages out before making a first purchase. Thoughtfully presented content will reassure them they’re dealing with a legitimate company. If you simply add bare contact information or a few paragraphs of bland company history, you’re missing out on a valuable opportunity for active marketing, branding, and sales. Testimonials are often treated as an old-fashioned cliche, but they play a vital role in building social proof. Instead of ignoring them or relegating them to an obscure page, place believable, relevant testimonials strategically around your money pages to give conversion a real boost. Search engine optimization, or SEO, isn’t magic dust sprinkled over a website to make it rank. When done properly, it’s an integral part of the site and should be considered from the get-go. Use strong keywords throughout your copy and URL structure, use well-formed coding, and make sure your site loads quickly and without errors. Unfortunately, many off-the-shelf e-commerce packages perform poorly in SEO terms, so choose your platform wisely before committing too many resources to site development. But it’s not only search rankings you need to optimize for. For an e-commerce site, conversion rates make the difference between mediocre performance or stellar profits. Unfortunately, even the most carefully designed sites don’t always convert as highly as you’d expect. Setting up a split testing mechanism lets you try out different combinations of copy, images, and element positioning, and measure how the variations feed through into sales. If your site is built with Divi, split testing is built in to test out differnt content. Even small changes can bring unexpected upticks in conversion rates. If you’re not building your website with testing in mind, you’re leaving money on the table. Not an e-commerce site? Conversion still plays a factor. Your call-to-actions are no less important – nor the design that leads users to them. With more than half of web traffic now flowing via mobile devices, you simply can’t afford to ignore mobile compatibility issues. Test your site across as many smartphones, tablets, and other devices as you can. Use real devices if possible, or one of the many online emulation services. To put it bluntly, modern websites which work badly on mobile devices can’t be taken seriously. Based on Google Algorithm changes, these sites won’t even be served up to mobile users for consideration. Lastly, building a great site doesn’t grind to a halt the moment it’s launched. You need to continuously add high-quality content to keep your visitors engaged and the search engines happy. Traffic and sales soon dwindle if a site stands still for long. Whether you use an in-house team or outsource the work, make sure your budget has room for ongoing content development to keep things fresh. A well-designed e-commerce site can be a goldmine for a business, but it’s easy to miss the mark and wonder what all the online fuss is about. Pay attention to these nine vital issues, and you’ll be ahead of the game compared to most of your competition.